1 map on 3 sheets : ; sheets 84 x 64 cm. Scale [ca. 1:130,000]. Statute miles 15 [=189 mm.]. Part of a collection of restrikes from original plates, some of which were used in the Atlantic Neptune. Apparently a proof state, title panel incomplete; original produced by Des Barres ca. 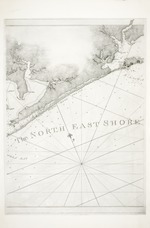 1780. Relief shown by hill shading, bathymetry shown by soundings.
. 9 it *r .